Take another trip around the world-famous board in Monopoly Big Money Reel, a 5 reel, 20 payline video slot from WMS. It comes with glossy visuals, a laid-back jazzy soundtrack and a quartet of feature rounds that offer bonus prizes, free spins, multipliers and plenty more besides. Play on your desktop, tablet or mobile from between 40p and £200 per spin. Like the other video slots in the Monopoly series, there’s a luxurious feel to the design in Monopoly Big Money Reel. On the reels you’ll see thimbles, shoes, wheelbarrows, top hats, cars, boats and planes. More rewarding are Scotty the dog, a hotel and Mr Monopoly which spin in full stacks. The most rewarding symbol is Mr Monopoly who pays up to 7.5 times your bet per payline. There’s also a wild. The assortment of different valued Monopoly Notes are the scatters. WMS has packed in a good range of features into Monopoly Big Money Reel. Mystery Bill feature – extra Monopoly notes can be added on each spin. If they fill the whole screen, you’ll be awarded a special bonus prize of 5, 10, 15, 20 or 50 times your total bet. Monopoly Big Money Reel Spin Bonus feature – any combination of 5 Monopoly Notes on the same spin triggers this spin the wheel style bonus. Cash prizes of between 5 and 25 times your bet, multiplier boosts and a trigger of the Utility Bonus or the Go Free Spins Bonus features are on offer in this round. Utility Bonus feature – a 2.5 times bet credit is awarded to start with. Then pick from Mr Monopoly’s hands. If you find a spin, you’ll get a go on the Big Money Reel. This awards prizes of up to 12.5 times your bet or multipliers. After the spin is over, pick again. The process is repeated until you land a collect or a collect x2. With the x2 multiplier, your total credit bankroll win is doubled. Go Free Spins Bonus feature – to begin with, you’ll receive 8 free spins. Before they start, pick from the Go symbols which will reveal a Monopoly Note. This can deliver special cash bonuses during the feature. You can re-trigger more free spins here too. You’ll win at least 10 times your bet here but usually more. We’ve not always enjoyed the Monopoly-themed slot games from Barcrest and WMS, finding them too cluttered with complex extras. They’re done a nice job here though, finding the right balance between variety and playability. The design is just what we’ve come to expect here too. There’s a definite luxury feel to the action. The features offer plenty of potential too. 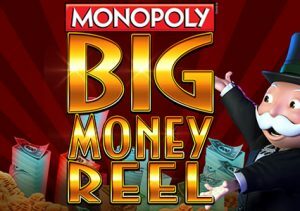 If you’re a fan of the classic board game or just fancy a video slot that offers a good selection of bonus features, then Monopoly Big Money Reel should fit the bill rather nicely. I would suggest you try Epic Monopoly II (from WMS) which is highly volatile.